Viral infections can reduce plant vigor by disrupting cellular functioning, but do not commonly kill plants. Tobacco mosaic is one of the most highly persistent tomato diseases because it can remain viable without a host for many years and it is able to withstand high heat. The virus is spread primarily by mechanical methods. Gardeners can contaminate their hands when they touch tobacco products or infected plants and weeds and spread the virus to healthy plants. Tobacco mosaic virus is not as distinct as other viruses, but yellow-green mottling on leaves is the most characteristic symptom of the disease. 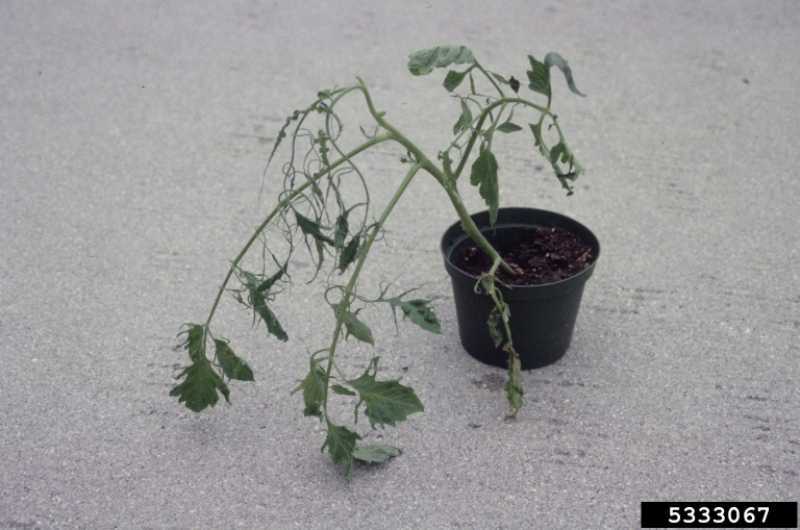 Infected plants have stunted growth, and flowers and leaflets may be curled, distorted, and smaller than normal in size. Open blooms may have brown streaks through them. 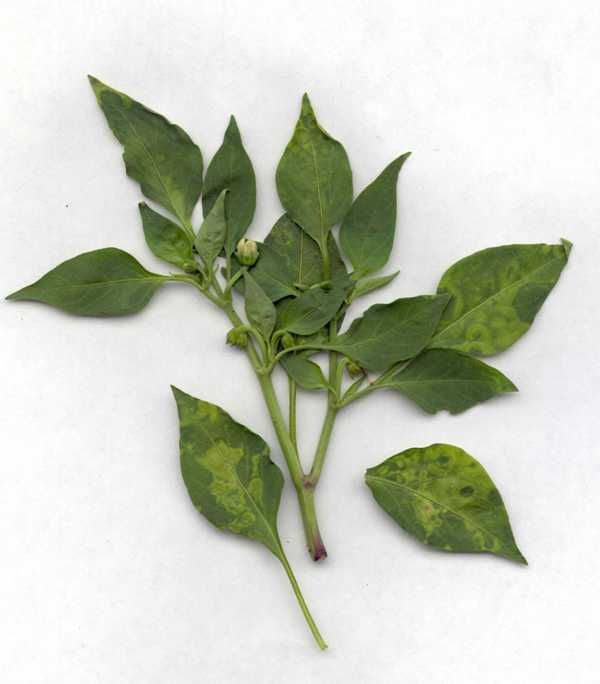 Yellow, chlorotic spotting is characteristic of pepper plants that are infected. Tobacco mosaic virus survives on infected seeds, plant debris, and even clothing for months or years. The virus enters plants through wounds sustained in transplanting or pruning. It spreads rapidly once it is in the host. The virus can remain viable for years on dried plant debris and is extremely tolerant of very high temperatures. Tobacco products are the most common source of inoculum; smokers can infect plants by handling them. The virus is not spread by aphids. 1. Remove and destroy infected plants. Pull plants with mosaic symptoms immediately. Remove the debris from the garden area and bury them if possible. 2. Keep your garden weed-free. Some weed may be harboring the virus. These represent sources of inoculum. 3. Always wash your hands thoroughly and disinfect tools. Before handling plants, wash with soap and water, especially if you're a smoker. 4. Plant resistant varieties of tomato. Suggested varieties include: ‘Big Pick’, ‘Celebrity’, ‘President’, and ‘Park's Extra Early Hybrid’. Other resistant varieties will be labeled TMV resistant. Strategies 1, 3 and 4 are strictly organic approaches. Using an appropriate organic herbicide (or removal by hand) would be a viable organic approach to Strategy 2.